This webinar helps financial institutions understand how to apply a holistic “positive impact lens” to portfolios or products for corporates with unspecified use of proceeds. 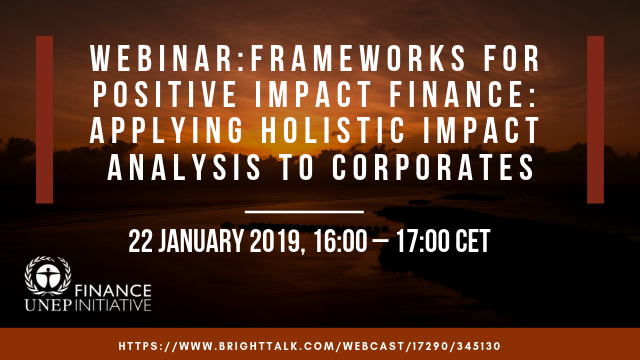 The webinar is based on the recently launched Model Framework that serves as a basis for a new working group on holistic impact analysis, bringing together financial institutions to test the framework with real-life cases and to share learnings. Model Frameworks are the tools through which the Principles for Positive Impact Finance (PI Principles) are interpreted and implemented. They have been developed by the PI Initiative to guide the delivery of “positive impact financial products” and for ongoing portfolio monitoring. Financial institutions can use the Model Frameworks to develop or adapt their own frameworks. Auditors, analysts and other stakeholders can utilize them to verify or provide opinions on the positive impact of financial products.